WorldofVolley :: CL M: Perugia claim quarterfinal spot, Maaseik causes shock at Energia Hall! 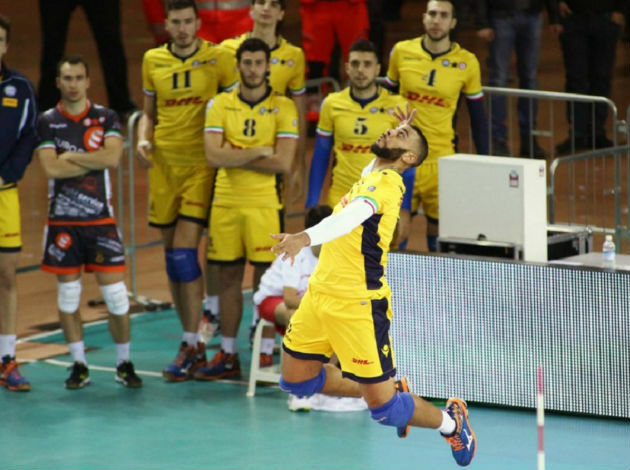 CL M: Perugia claim quarterfinal spot, Maaseik causes shock at Energia Hall! Perugia will play in the quarterfinals of the CEV Champions League after beating Tours in straight sets 25-20, 25-20, 25-19. It was their fourth win in the Pool F and it means they will play in the next round. Tours didn't have any chances in this game since Perugia's players were in the mood. Wilfredo Leon (14 points) and Aleksandar Atanasijevic (11 points) were the best scorers of the Italian team. After smashing PGE Skra Belchatow in the second round, Greenyard Maaseik have managed to do it again. This time, the game was played in Poland and the Belgian side won it to stay in the race for the next round. Maaseik were two times down but managed to make a comeback and later to create a complete turnaround. Jolan Cox led Maaseik to the win with 23 points, while Milad Ebadipour had 16 in the home team. Halkbank have also scored an important win in the Pool A, beating United Volleys in four sets (25-12, 23-25, 25-22, 25-21).